The Beanfield Centre (formerly named Allstream Centre) is a large conference space located near in Toronto's Exhibition Place close to the Waterfront. You can access it by car, transit or bicycle. Directions are provided below. For more information, you can access the Beanfield website. Take the Bloor subway to Bathurst Station, board the #511 streetcar south to Exhibition Place. There are two streetcar stops at Exhibition Place, at Strachan Avenue, and adjacent to the Horse Palace/GO Station. Take the Yonge-University subway to Union Station.Take the “West-509 Replacement Bus towards Exhibition” which boards on Bay St. and Front St West. 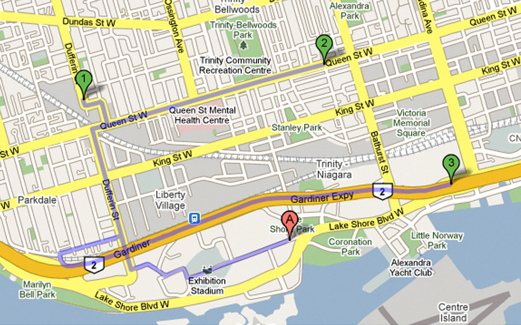 There are two streetcar stops at Exhibition Place, at Strachan Avenue, and adjacent to the Horse Palace/GO Station. NOTE: For events held at Direct Energy Centre & Beanfield Centre (formerly named Allstream Centre) please use the Strachan stop adjacent to the Princes' Gates. For events in BMO Field, Ricoh Coliseum, Queen Elizabeth Building or Better Living Centre please use the the TTC loop at the end of the line. Take Lake Shore Boulevard to the Princes' Gates (just west of Strachan Avenue). Take Lake Shore Boulevard west, and drive through the Princes' Gates (just west of Strachan Avenue), or turn North onto Fort York Road, and west at the lights on to Strachan Avenue into Exhibition Place. Underground Lot is located in Enercare Centre and connects to Beanfield Centre (formerly named Allstream Centre) via an underground link. Underground rates increase $3 on peak usage dates. Increased rates for BMO Field events and Special Events. All parking lots are operated by Exhibition Place. Taxi cab service is available at all main entrances. We also offer exhibitor parking programs and valet services. For additional information please call Parking Services at 416-263-3646. Exhibition Place provides a total of 88 wheel chair accessible parking spaces throughout all of its surface parking lots and indoor garage. All spaces are located near the entrances to the lots and/or close to the pedestrian access points to buildings and event space. Regular parking rates apply.